MEMBERS OF THE Defence Forces who carry out extra duties during the upcoming papal visit will receive just €47.59 for each 24-hour period they work. A number of soldiers have been tasked with carrying out additional work during the World Meeting of Families in Dublin from 24-26 August. According to the Department of Defence, soldiers are required to provide assistance to civil powers, which can include gardaí, when requested to do so. 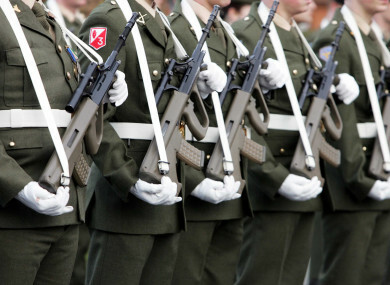 A Department spokeswoman told TheJournal.ie that soldiers are paid €23.81 in Security Duty Allowance for each day on duty, rising to €47.59 for a 24-hour duty. A number of groups have hit out at the Civil Authority Allowance, saying that “morale is on the floor” because of the amount on offer. Ger Guinan of the union PDFORRA said the sum was “absolutely meagre”, and represented a continuation of practices seen during Storm Ophelia and Storm Emma. “The current rates are directly leading to a recruitment crisis,” he said. “New recruits are dropping out before psychometric testing is even conducted. Shelley Cotter of the Wives and Partners of the Defence Forces group said soldiers were spending extra time working when they could be enjoying time with their families. She agreed that while providing assistance was part of the job of soldiers, it is believed the Defence Forces are repeatedly being called on to help. Fianna Fáil spokesperson for defence Jack Chambers said the move represented a further blow to morale within the Defence Forces, and called for additional pay to be given to soldiers. He said: “The level of disregard and the unacceptable attitude towards these members is only compounded by this latest kick by Government to ignore the working time directive ahead of the Pope’s visit. “Just this week we heard of members of the Forces struggling to keep food on the table. A spokeswoman for the Department of Defence said that the Defence Forces had been assigned a role to assist civil powers in the White Paper on Defence. In a statement, she said: “In relation to the mass in the Phoenix Park, An Garda Síochána have requested the assistance of the Defence Forces in a security and support role before and during the mass. The spokeswoman was not able to specify the exact number of soldiers who would be paid Security Duty Allowance, but said that those who completed 24-hour duty on a Sunday were also entitled to time off in lieu. “The rates for Security Duty Allowance were last revised under the Haddington Road Agreement in 2013, when it was agreed in negotiation with the Permanent Defence Force Representative Associations, that as part of the cost saving measures to be secured under the Agreement, the Saturday and Sunday duty rates would be flat rated,” the spokeswoman added. Meanwhile, a spokeswoman for the Defence Forces said it was unable to comment on issues related to policy or pay. With reporting from Paul Hosford. Email “'Morale is on the floor': Defence Forces to be paid just €47.59 per day for extra work during Pope visit”. Feedback on “'Morale is on the floor': Defence Forces to be paid just €47.59 per day for extra work during Pope visit”.